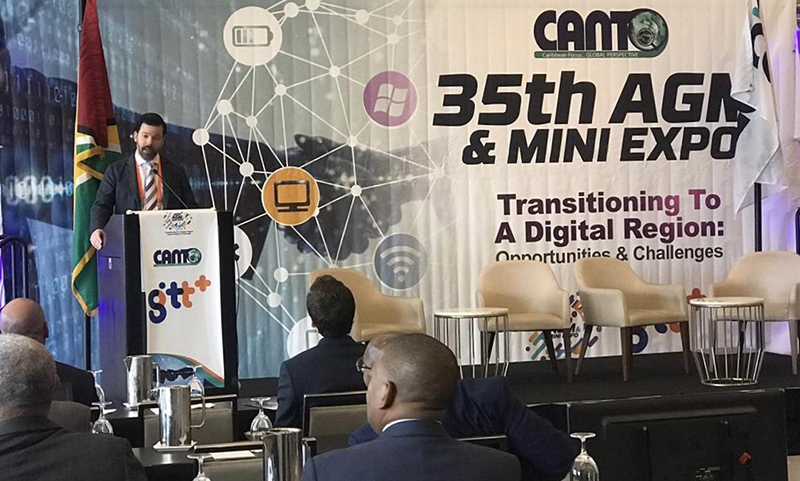 Fireminds CEO, Michael Branco delivered an address on Digital Transformation to the CANTO AGM attendees in Guyana, which included several Government Ministers from CARICOM governments, executives for a number of the region’s leading telecom companies and distinguished guests. The theme of the Caribbean Association of Network & Telecom Operators was “Transforming the Caribbean to a Digital Region”. Mr. Branco spoke about what digital transformation through “leveraging modern infrastructure to enable economies and communities alike” and how Fireminds operates at the intersection of software development and cloud, where digital transformation occurs. Mr. Branco emphasized the need for all entities including small to medium businesses, Corporate, Enterprise & Government, in the region to move towards the cloud to realize the savings and gain the agility associated with these solutions. “Within the Caribbean, a number of businesses are still operating through on-premise servers to drive their businesses. This legacy model ties the business to a higher cost base and a lack of dexterity in providing agile technology solutions. Furthermore, it exposes IT infrastructure and by extension the business to our biggest regional risk, natural disasters. As a region, we must mature our IT infrastructure to be cloud based to enable better growth in our respective island economies,” he said. In addition, the keynote address spoke about the traditional challenges of utilizing public cloud from the Caribbean, citing hurdles such as cost of connectivity and network latency. Solutions surrounding the utilization of the hybrid cloud using private cloud solutions to deliver applications in the region and backup to public clouds. Mr. Branco also announced the availability of Microsoft Azure Stack in Bermuda, Cayman and Guyana available through Fireminds private data centers, with further information to come on that exciting announcement. “The event co-hosted by Fireminds sister company GTT who operate the largest telecom in the country of Guyana; A booming industry due to the recent discovery of oil. The event was also sponsored by Microsoft,” a spokesperson said. “Data protection and residency was a hot topic of discussion for attendees which included a number of regional regulatory authorities. Mr. Branco spoke about how Fireminds solutions embrace SOC2 and ISO27001 standards to normalize data protection and privacy concerns across its wide base of regional clients. “As a member of the ATN group which owns and operates 5 telecom companies, Fireminds has enjoyed further growth in 2018, unifying the already existing Enterprise Services under ATN into one product offering for the region which includes software development, cloud, private data centers, managed services, SD-WAN, L1 call centers, IT Consulting and procurement.